Helping our community one nappy at a time! On behalf of the Banna Team, I would like to thank our local community for their support during this years Nappy Collective. Between 13-27th October Banna Property Group collected just under 1500 nappies – Our best year yet! 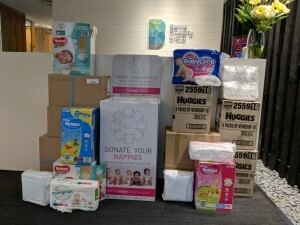 The Nappy Collective collects unused disposable nappies and redistributes them to organisations that support families affected by domestic violence, as well as families in crisis or in need. I am so happy to have had the opportunity to be involved with this years campaign & am humbled at the response we received!